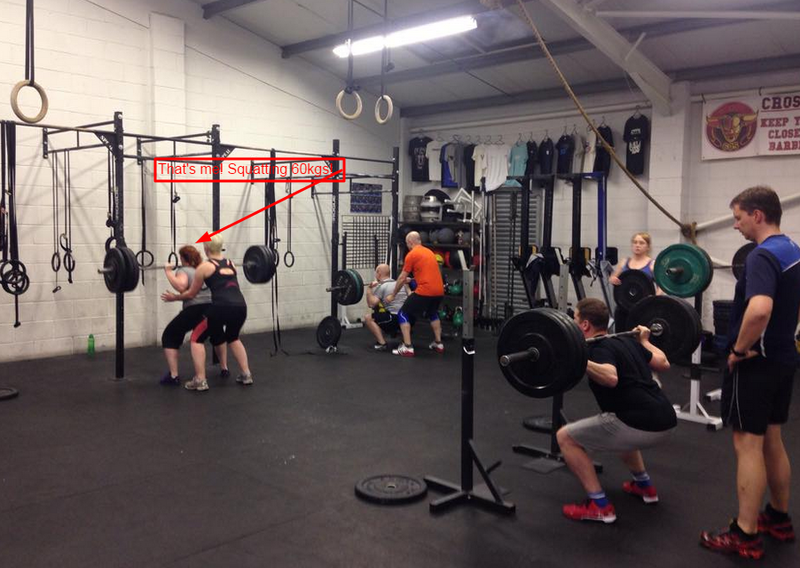 I started Crossfit back in October 2014 as an overweight, reasonably unfit, slightly terrified person. I’m still a bit overweight but I can definitely say that I am a lot fitter and a lot less terrified now. I’ve not lost very much weight but have managed to lose 3 inches or so (going on belt holes) from around my waist and everything fits a lot better. I can feel actual muscle under my skin now and have some definition. I’m substantially fitter than I was – other than being diagnosed with asthma after a horrible chest infection. I still don’t enjoy running much as it leaves me struggling for breath and multiple burpees still make me want to cry, but I’m able to do them, which is more than I used to be able to do. While I had previous history of weight training, I had never done Olympic weight lifting and I was scared. I knew how complicated and difficult things like hang snatches and power cleans could be and yes, they are still difficult and take a lot of both agility and brain power but they are slowly becoming more comfortable and less scary! Barbells are moving into the friend territory rather than the enemy territory. I am even managing to squat lower every time I go. Being the worlds most inflexible person, doing things like squats properly is very difficult. Slowly tho, my flexibility is increasing. So yes, I would definitely recommend Crossfit to a lot of people. I don’t think it’s for everyone. And I know that pro-weight-lifters are quite disparaging of it but it has made a huge difference to me and my ability to do things. Which has increased my confidence hugely and makes me want to work out more and more. In fact, I’ve just changed from my twice a week package to unlimited.